Scroll down through this main text page, click on the thumbnail images that interest you; a larger image will appear in the left frame. Click on the centre icon below to see all the larger images in sequence in the left frame. Although the prime influences on Roman art and architecture were Etruria and Greece, the roots of Roman pottery are more widespread. Within what became the Roman Empire, other cultures besides the Etruscans and the Greeks, were making ceramics - in very different styles. In Egypt, for example, we have seen complex and often brightly coloured pieces of fritware. In the cities along the Eastern Mediterranean and deep inland in Persia and Mesopotamia brushed or poured pottery glazes were now being developed: blue alkaline glazes and a new shiny glaze based on lead. The Celtic pottery styles of Europe were still evolving when Europe became part of the Empire. But in Britain, at the edge of the Empire, this curvilinear style did survive the classical make-over and produced some exceptional Romano-celtic pottery. All these styles continued to develop during Roman times and so can also be described as "Roman Pottery". In fact during the early centuries of the new millennium there was an enormous increase in trade and flow of goods between the provinces of the relatively peaceful Empire so a growing stylistic similarity did appear. Ceramics and other crafts increasingly shared style details, shapes and patterns producing a "Classical" or "Roman"flavour. All over Europe, North Africa,and the Near East vast quantities of Roman pottery have been found. 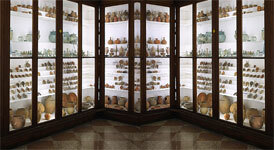 Most are now in National and Provincial Museum Collections. The great majority of the finds are roughly made cooking or storage pots. But as we examine more closely the variety of ceramics made in the Roman World we find a lot more than rough kitchen pots. 8002 Common Roman storage jars. Known to Archeologists as "Coarse Ware" such pots were made out of the local clay, usually a common red. Generally wheel-thrown and unglazed, the pots were once fired to about 900-1000'C.in simple updraft kilns, variants of those used by the Greeks and the Etruscans, the slip and firing techniques also owed much to the Greek and Etruscan potters. Probably the most common but still important group of pots. Kitchen storage vessels for for oil, wine, water, vinegar, milk, etc. Being primarily utilitarian, most were wheel-made out of a local clay of any colour. Very few were slipped or glazed and only rarely were they decorated. Characteristics: sturdy form, thick walls and with strong handles. Some common types: kitchen pots for cooking or storage; large jars for oil and wine, dishes or platters for serving. Most types could be found all over the empire. Better quality serving ware was dipped in a smooth red slip. Occasionally pots were fired in smoky reduction atmospheres when they became grey or black. Exuberant folk-decoration here, a coarsely modelled face on the waterjar. The large thick walled dish with a spout is a kitchen mortar and mixing bowl: for grinding grain, nuts etc with a pestle, or mixing and pouring. Typical ware from the outer provinces. These were found and probably made in Britain. 8005 Collection of Large Wine Jars in Roman Museum at Arles, France. For transport and export of wine or oil large pots were made, usually by the coiling method described in Tutorial No. 2. These illustrated here are between 2 - 4 feet high. 8006 Large Wine Jars found in tomb of British Chieftan. Ht:ca.130cm BM. The Romans followed the Greeks and Etruscans in making their better pottery from a fine red terracotta body. Red clays are the most common clays in central Italy, and the Romans were traditionalists. They also adopted the Greek technique of using a smooth iron rich slip glaze to coat a coarser body. But, unlike the Greeks, the Romans usually preferred the simpler clear oxydised firing. In this firing the iron slip produced a glossy RED finish rather than a glossy BLACK. This "red gloss finish" was so widely adopted by Roman potters that it is considered a new Roman technique. Past scholars have coined placename terms for this oxydised vitreous iron slip-glazed terracotta ware:"Aretine" Ware, "Gaulish" Ware and "Samian" Ware, for example. Such pottery is more simply and clearly called Red Gloss Ware, with or without a place name. However, you will inevitably come across these place names in museum collections. This is a typical red gloss tableware bowl pressed in a step mould and finished off on a wheel. It was allowed to become leather hard, then dipped or brushed with the iron slip glaze, allowed to dry completely and then given an oxydised firing in a kiln to about 950°C. This pot is now worn and has lost some of its shine and top coating of iron slip around the rim. This allows us to see the lighter, somewhat coarse body underneath - a contrast to the surface which after firing is smooth, glossy and red. More examples of Roman tableware, a fine textured terracotta body, finished off with the rich terracotta red glossy surface. Vast amounts of this good quality table ware was produced by a combination of techniques: throwing, turning and pressmoulding, mostly by slave labour in large factory complexes all over the Empire. 8015 Arretine Crater, or large bowl. Found at Capua, Italy. Diam:19cm. ca.27BC-14AD. BML. Originally this bowl stood on a tall stem, now missing. The sides are decorated with raised figures representing the Seasons. Most comfortably off Romans would expect interesting shapes and or some relief or applied decoration on their tableware. We can see such bands of relief decoration on many of the larger bowls. The potter's stamp Cn.Ateius is impressed. Many of his pots have been found in Germany. It was made during the time of the first Emperor Augustus probably in one of the large potteries at Arretinum(Arezzo). 8016 Detail of the press-moulded relief decoration, diam:24.8cm. Graufesenque, SW.France. 1st century BC. BML. There is little doubt that this relief decoration was directly inspired by decorative relief metalworking techniques we now term repoussé. 8017 Fine decorated bowl made in Central Gaul early to mid 2nd century AD. BML. By the 2nd century AD. more large potteries were established in central Gaul not far from present day Lyon. This fine bowl has considerable stamped and press moulded relief decoration. It was made in Central Gaul in Hadrianic times by the potter Butrio. Today, although rather worn, one can still see the range of figures and medallion scenes. These include caryatid figures and dolphins. The medallions depict various scenes including one with Venus and cupids and others with a drunken Bacchus and a drunken Silenus supported by satyrs. The influence of repoussé metal work is very clear. 8018 Detail of relief medalion from the decorated bowl. Though worn this detail gives some idea of the rich relief decoration. The bowl was found in England. It is thought to have been one of the first imports to arrive at the newly founded settlement at Stonea Grange in the 2nd century BC.Small metal moulds were often used to produce this sort of crisp detail. Soon after its arrival in the 2nd century AD. it got broken and was then painstakingly repaired with lead rivets. We can still see the drilled holes and some of the remaining lead rivets. It survived into the 3rd century AD when it was broken a second time. This time it was thrown into a Roman rubbish pit where it was found by an archeological team. This shows how the potteries manufacturing Red Gloss Ware expanded northwards from Italy(Arezzo),across the Alps into Gaul. As the Empire expanded northwards from the 1st century AD, the Roman urban way of life became established across Europe. 8021 shallow red-gloss serving bowl with press-moulded relief decoration, diam:24.8cm. Graufesenque, SW.France. 1st century BC. BML. Clusters of potteries making red gloss tableware were set up first in Southern Gaul not far from presentday Toulouse in France during the first century AD. This bowl is a good example of South Gaulish decorated tableware in the 1st century AD. From now on these potteries set up in Gaul competed with and surpassed Italian potteries making decorated red-gloss tableware. By the 2nd century more large pottery factories were established higher up in central Gaul, not far from presentday Lyon. As the legions passified Central and Eastern Gaul, Roman pottery workshops and brickworks soon followed. By the 3rd and 4th centuries such potteries were established as far as the Eastern Rhine and across the Channel to Eastern England. We tend to forget that mass-production pottery had started long ago in prehistoric Mesopotamia. 3000 years later factories making pottery had become a dirty and unpleasant feature of some areas of large 5th century BC.Greek cities. In the Roman Empire, pottery factories became even larger and more numerous; some towns devoted much of their commerce to pottery-making. Moulds and stamps made of fired clay, wood and metal were important tools in the Red Gloss Tableware workshops. 8022 Terracotta bowl mould showing impressed design. ca.10BC-10BC. VAL. Moulds such as these were made by impressing the soft clay with metal pattern stamps. Often specially made roulette wheels were used for linear repeat patterns. 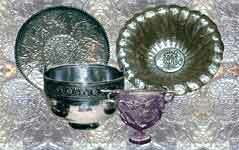 It is thought that many of the various metal pattern tools used were originally made for repoussé work on silver bowls and dishes. 8023 Portion of Arretine mould. Ht:11.3cm. BML. This fragment of a bowl mould used to press-mould raised decoration around a clay bowl. It shows a sharp hollowed-out negative of a dramatic scene: men and a horse attacked by a wild bear. 8024 Detail of of Arretine mould. Ht:11.3cm. BML. Near the head of the rider is the stamp "M PEREN",(letters stamped in reverse), of the potter M.Perennius. This impressed design in the mould was probably made by pressing raised metal shapes and figures into the inside of a soft leather-hard thick walled bowl. When completed such a bowl mould would be fired before use. 8025 Fragment of a mould made in Colchester, England late 2nd Century AD BML. A fragment of a 2nd century AD British mould for relief decorated red gloss ware which is closely related to some East Gaulish ware. 8026 A South Gaulish (Lezoux) cylindrical vase 2nd century AD but found in Bedfordshire England. BM. The raised decoration is quite shallow though crisp, especially on vertical pots like this. Shrinkage would allow the leather-hard pot to drop out of the mould. This pot would have needed finishing off on a wheel. The ring base would have been thrown directly onto the leather-hard pot. The smooth rounded rim was almost certainly formed or finished off using the wheel. The large name stamp of the workshop of Divixtus is part of the raised relief decoration. 8027-8 Small press-moulds & 8028Two lamps. BML. Clay lamps would have been produced in their thousands from moulds made of fired clay or plaster. A two-piece mould would have been used to make such lamps. (1)The underneath, a half pear shape. (2) The top with the impress stamped decoration. When tipped out of their moulds and leather hard, the two pieces forming the lamp would have been luted(stuck together with thick clay slip). Oil and wick holes would be made, then perhaps the lamp might be dipped in the red iron slip-glaze before firing. 8029 A very small fired clay press-mould with carved, or pressed-out, decoration. BML. Could be used to produce a raised decoration on flat lids like the lamps. It could also be used to make separate small clay sprigs(tiny clay ornaments) to add to pots. Various versions of this sprigging technique have been used through the ages. 8030 A small press-moulded clay figurine. The same technique: a two-piece pressed drop-out mould. The back part hardly modelled, often almost flat. Very little different from similar Etruscan figurines. After firing, some were painted over with a gouache or tempera water paint. On most pieces this colour has worn away. 8035 small jar. Britain. BML. These pots show the influence of glass and glass-working and decorating. This bottle-like form is a simple example of imitating a glass-blown and altered form. 8036 small bowl - marbled slip. Britain. BML. This dish decorated by dipping in a bucket containing two different coloured slips but which had not been stirred. It's a common enough technique in first year pottery classes today, but in the first centuries of the new millennium AD when marbled coloured glass techniques were widely used in the Roman World this is likely to be a potter's attempt to imitate the competition. 8037 A small red gloss bottle, incised decoration. Britain. BML. This style of incised Red Gloss Ware is a direct imitation of the pattern grinding technique of cut glass. The free curving patterns are characteristic of other Romano-British decorations. 8038 Black gloss bottle with incised decoration. Eastern Gaul. This black gloss example of cut glass imitation from Eastern Gaul shows a more geometric banding decoration of cuts and slashes and a roulette banding and is closer in style to Roman glass-pattern grinding techniques. Beads and small pieces of blue fritware from Roman times and much earlier can be found in graves all over Europe and the Middle East. These later discoveries and inventions in frits and ceramic glazes occurred almost entirely in the Eastern part of the Empire. Note: Pre-Roman fritware was covered in earlier tutorials 4 & 5. 8039 & 8040 Two small Egyptian Fritware Amulets. These two tiny objects from Roman times are Egyptian amulets, placed on the body for protection against evil. In the rectangular pressmoulded shape, tiny rolled threads and buttons of different coloured frit are pressed into grooves or hollows made in the soft yellowish fritpaste. Such work would be quite time-consuming. 8041 Fritware Eye of Horus amulet. This example shows the care taken to produce dry dark grooves to heighten the colour and shapes. The yellow frit burnt away in parts. This tiny lozenge shaped amulet echoes the shrouded body on which it was placed. Notice the outline of the protective Falcon God Horus. Made by pressing tiny rolls of white fritpaste into a scratched line drawing. The head was modelled in a reddish fritpaste and placed into the hollow in the pressmoulded lozenge shape. The high shine of this piece suggests that it was brushed over with a soda frit paste before firing. 8043 Press-moulded fritware vase. Ptolomaic Egypt. Complex and colourful pieces of fritware continued to be made in Roman Egypt and in Palestine, Syria, Persia and Mesopotamia. The making techniques were progressively refined. A miniscule frog forms the mouth of the jar and is less than 1-2cm. across. Look at the texture of this surface. I find it more likely that these are simply early examples of clay pots brushed with or dipped in glaze, not 'fritware' nor 'glazed composition' as often labelled. Maybe we potters sometimes know better than archeological experts how these things probably made! 8047 "Fritpaste" jug. "Boy on a Goose" ca.300-250BC. BML. A unique vase showing the boy Eros riding on a goose. Ornamental or ritual jug. Described as "faience" (by the Museum label) which means fritware. Said to have come from a Tomb at Tanagra, Boeotia, Greece. Also may have been imported from Alexandria, which was the chief producer of fritware in Helenistic times. With little else to go on except my own visual examination, I rely on a potter's instinct: I am convinced that it was part thrown, part press-moulded, and some details modelled. The various pieces were luted together with body slip. 8048 Detail: Fritpaste jug. "Boy on a Goose" ca.300-250BC. BML. But what is the body? Most is pale buff or white: the neck and head of the goose; the winged boy figure of Eros; the funnel-like neck; the ribbed ring handles. All these parts appear glazed with a smooth, slightly glossy white. This is evident where the glaze has chipped or flaked off, for example, on a part of the boy's leg and also the ribbed handles. The glaze looks a bit dry, pitted and slightly blue on the neck and head. The goose's body has a quite different feel; it is covered with sgraffito patterns in the white glaze. Where scratched through, the dull buff-grey background appears. The patterns on the front part of the body vaguely imitate feathers, the rest is a scratched herring bone pattern. I would expect the buff body to contain soda material and even powdered glass. The white glaze or slip-glaze may be similar but with a greater portion of fluxes. The boundaries between glass, glaze and clay body were becoming blurred. Many different glass and ceramic mixtures were being explored in the Eastern part of the Empire. In a later tutorial we will see how these various new mixtures were to contribute a vital element in the Islamic Ceramics of Persia and Iran. 8049 Hellenistic(Egyptian) libation jug ca.300-250BC. BML. Although decribed by the museum as "faience", this clay jug was undoubtedly thrown on a wheel. The handle was shaped by hand and luted on with slip. The the broad bill-like spout was shaped with the fingers. It was made from a pale ochrous clay body and could not be fritware. It appears to me to be covered with a underfired glaze or slip-glaze. The figure represents a hellenistic queen of Egypt pouring a libation at an altar. 8050 Detail of jug above. Sprigs - (small press-moulded pieces) of a draped figures were applied to the sides with slip. When finished and leather-hard, the jug was covered with an alkaline glaze. It was probably a finely ground mixture of soda ash, sand, chalk or white clay and perhaps powdered glass; mixed with water, then brushed-on or poured-over which is why it appears unevenly applied. The fired result is hardly a glaze, it does not have a high shine, in fact it seems dry and pitted. This suggests that it was more a vitreous slip rather than a melted glaze. The mixture did not contain enough fluxes to produce a glaze at the temperature reached. My guess is that other pots in the kiln might have fared better, reached a higher temperature and become much smoother. Nevertheless, this recipe was along the right lines towards producing a proper glaze. No written evidence has survived to tell us of the time and place where the first "true" pottery glazes were made, but many archeological sites in Western Asia have produced actual examples of glazed pots made during the first millennium BC. Much of this points to Syria - Irak - Iran being the region where true brushable glazes were first developed. After centuries, even millennia, of making variations of soda fritpaste recipes to pressmould. ca.500-200BC. During Ancient Persian and Hellenistic times, potters gradually began to understand some of the essentials about glaze making. These developments were probably linked with the expansion of glass-making and decorating with the invention of glass blowing. 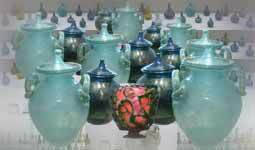 Before the Christian Era, Middle-Eastern potters and glassworkers in Persia, Syria, Palestine and Mesopotamia had developed a variety of colours in glass and glaze. 8051 Alkaline brush-glazed vessel.Ht:ca.25cm. N.Syria. 2nd-3rd century AD. BML. During Helenistic and Roman times real alkaline glazes appear on clay pots in the Western Asian region - on the edge of the the Roman World. Glazes fluxed with soda which were truly brushable or pourable and usually coloured blue with copper. Potters had at last arrived at simple practical soda fluxed glaze recipes. The powdered materials mixed up and applied as a paste to dry or leatherhard clay pots. 8052 Alkaline-glazed vessel. prob. N.Syria. 2nd-3rd centuries AD. No records exist for the recipes, but they would have been made from materials containing soda plus silica from finely crushed quarts or sand and a little fine iron-free clay. Black copper oxide or other copper compound produced the bright blue colour. It is possible that powdered glass was also an ingredient in some potteries. Once the essential ingredients had been established the technique became common throughout Western Asia though rare in the Western Roman World. This example from Southern Iraq in the 1st or 2nd centuries AD. has a bright shine, though characteristic of all alkaline glazes it is heavily crazed. The yellowish colour of the clay body shows through the transparent copper blue glaze producing a greenish glaze. Also from Southern Iraq at Uruk near the Persian Gulf come these two large glazed pieces. A carved and impress decorated coffin and lid glazed with a brushed or poured soda alkaline-copper glaze. This photograph I took some years ago shows its age, but it is good enough to see what an impressive glaze and firing task this was. With a closer detail, the style of decoration of the lid can be seen more clearly: press moulded repeats of a figure with a strange head-dress. The edge of this shield-like lid is finished off with a simple running pattern made by two incised lines and a row of small dents - perhaps done with a finger or thumb. This detail shows these figures more clearly. Rows of them run the length of the lid. The body is a quite coarse and probably contain lime and sand. This was not very sophisticated pottery from a form and design point of view, but technically it is very impressive, many difficult things have been achieved: the sheer size of the two pieces with making, decorating, glazing, firing problems to be overcome. The alkaline blue glaze has an excellent glossy shine with relatively little crazing, even though applied quite thickly and much of this glaze has stayed on the fired body. This final detail shows clearly the strange head-dress, or maybe it is a helmet or a hairstyle. I would assume that the figure represents a warrior - there is a sword in the left hand. The stamp used for this decoration could be used in producing raised decorations on metal shapes. It could be carved in wood of a clay block and fired. The thick transparent glassy blue glaze settles in the hollows outlining the simple figure shape with a deep blue. Elsewhere it is thinner and the ochreous colour of the clay body turns the glaze to a more greenish blue. No glazed object this size was made in Roman Europe. 8058 Two pottery oil lamps - one is lead-glazed. Although found all over the Empire glazes fluxed with lead are rare. The earliest lead glazed pots were perhaps made in Turkey at Tarsus and Smyrna in the 1st century BC. The technique reached Italy from the early first century AD and inspired Italian potters especially in Southern Italy and in or near Rome. These in turn led to small pieces of lead-glazed pottery, such as oil lamps or drinking cups, being produced throughout the Empire from Britain to Bulgaria. This illustration shows the difference between a lead glazed and un-glazed lamp. The colour is usually due to copper but in a smoky firing small amounts of iron present in lead glazes can produce a dull green rather than the usual oxidised honey colour. 8059 Small decorated globular pot - glaze decay. Made near Rome ca.50-100AD. BML. Both lead and alkaline glazed objects often lose their sheen. Chemicals in the soil react with the glass of these low temperature glazes sometimes causing the surface to flake and become dull, occasionally this decay causes an attractive iridescence. A little lead-glazed pot decorated with rows of clay pellets pressed and then smoothed into the pot. Buried in soil for close on two thousand years, the glossy lead glaze has become attractively iridescent. 8060 Small lead-glazed boat jug. Made in S.Italy. ca. 1-50AD. BML. This small jug has been press-moulded from two vertical bowl-like shapes which have been luted together with slip. The handle too appears to have been press-moulded in two halves and then stuck onto the pot. The overall quality suggests a metal jug was copied - in fact mass-produced from biscuited clay or plaster moulds. The characteristic dull green colour and high shine of a typical roman lead glaze. 8061 Lead-glazed drinking cup ca 1st-2nd centuries AD. S.Gaul. RMA. This drinking cup has been thrown as a bowl then pressed in a biscuit or plaster mould to produce the raised leaf and grape-like shapes. Then upturned and a ring foot thrown on the bottom. Finally a small pulled handle was applied. Probably when stiff leather-hard it was brushed with the lead glaze containing a little copper and then fired in a kiln to about 900°C. 8014 Roman silver stemmed cup. This rare silver drinking cup is the sort of model used by potters when making their decorated lead-glazed clay cups which would often have included copying the stem foot too. 8062 A lead-glazed cup with moulded relief dec. 1st century AD Asia Minor. BML. 8063 A lead-glazed cup with applied decoration. ca. 1st century BC. Corinth AMC. This Drinking cup is more like a mug. It is also different from the last examples in that the relief decoration here is applied not raised out of the clay wall. This pot was thrown as a flaring cylinder and then the base finished off with raised ribs with a tool. On the outside of the leather-hard mug, an assortment of small press-moulded clay leaves and grapes(springs) was fixed down with slip. A press-moulded handle was also fixed and then to finish the decoration plant stems were trailed on in stiff clay slip(barbotine)in much the same way as one would do when icing a cake. Notice that above the ribbed lines at the base the decorator created a trail of raised lines imitating the egg and dart banding decoration. The brilliant limpid shine of a good lead glaze has survived well in this example. The copper green is rich too. Somehow I have the feeling that this type of pot was imitating Roman decorated glass as much as metalwork. 8064 Lead-glazed two-handled chalice. Made in or near Rome. AD50-100 BML. This vase imitates glass vessels of the period. An ornamental vase, probably for flowers. It has a brilliantly glossy grass-green lead glaze. Two Celtic vases with painted decoration 7019 ca.5th & 7020 in 1st century BC. Two excellent examples of Celtic pottery decoration before the Romans conquered Gaul. In the Celtic north of the Empire above the Alps, a distinctive curving, spiraling style of naturalism had already evolved on pottery before the arrival of the Romans. This refined, non-classical style of pottery decoration managed to survive in the far north of the Empire and was perhaps the most creative and original ceramic ornament of the whole period. 8065 Red Gloss slip dec. Beaker. ca. 3rd Century BC.British or Gaulish BML. A small red gloss vase with a high foot. Probably the most interesting thing about it is the piped slip decoration. The technique has come to be known as "Barbotine" a term introduced by French archeologists in the 19th century. This technique may have developed as a provincial attempt by Gaulish potters to imitate the press-moulded relief decoration developed in Italy. But this simpler technique was soon used to produce a very different style of relief decoration in Gaul. Instead of geometric patterns and classical figures, these Romano-Celts of the North made pots decorated with bands of gently curving plant stems in piped clay with added leaves and buds. Using this same technique, they also made bands of naturalistic figures, usually of leaping deer or dogs. The technique and the style only developed in Gaul and Britain. The similarity to Celtic metalwork designs is striking. 8066 & 8067 Two Romano-Celtic drinking cups from Britain. BML. These two are drinking cups in the Greco-Roman style - small two-handled bowls on a stem foot. These are functional pots to dip into a Krater of wine and then drink from, but their shapes and decoration display a quiet un-Roman style. Trailing with a stiff clay slip and using the fingers, tools and tiny sprig moulds, these Celtic potters produced many refined pieces. Sparingly decorated in that undulating manner is a trail of simple curving leaf or bud stems around the space between the two handles. The right-hand example still has a particularly good black vitreous slip-glaze. Such good quality black-slipped wine cups would also form grave gifts - substituting for the more expensive metal equivalent. 8068 Group of Romano-British pots. A group of barbotine decorated wares from Britain. Perhaps this trailed thick slip onto leather hard clay may be an attempt to echo a glass decorating technique. Whatever the exact origin, the finest examples come from the Rhineland, France and Britain. Most of these provincial pots were thrown and sometimes turned to produce a smooth surface before being decorated. The undulating curving rhythm of the decoration is a common characteristic of most of these pots - particularly those made in Britain. This little jar in the form of a poppy head is a particularly fine example of this style. The shape is simple but refined with a small but stable foot which produces a lively upward lift. This upward curve is then taken up by the spiralling lines of white slip which are a perfect decoration for this globular shape. The pairs of tiny dashes seem to bind the white curling stems together - and catch the eye. The three solid spots of bright white slip give real sparkle and complete this decoration which repeats threefold around the pot. Another unusual quality is the use of thick white slip painting onto a shiny black slip. Once again one is reminded of Celtic metalwork. 8070 Red gloss "barbotine" decorated cup.2nd century AD. British. BML. 8071 Detail of relief decoration. This detail shows more clearly the leaping deer and the writhing plant stems full of movement. An interesting touch you can see is the use of a small sprig mould - perhaps oiled metal - to squash a blob of clay into a crisply formed leaf. It does enliven the predominant effect of smoothness. The pot would be allowed to become hard leather-hard and then brushed or dipped in the fine vitreous red iron clay slip. This produced the striking glass and colour when fired in an oxidised kiln to about 950°C. I've come to the conclusion that these Romano-Celtic pots are perhaps the most original and sensitive ceramic decoration of the time. 8072 Black-Gloss Beaker Barbotine-decorated. 2nd century AD British BML. The glossy black slip caused by the more complex firing cycle gives a more sombre feel to the object. It probably was highly regarded as it looked like metal. Such pots were often used as grave gifts containing food. This beaker has a double row of hunting dogs chasing deer. The modelling of the animals in the piped thick slip is remarkable. The process of manufacture was exactly similar to the previous example except for the firing cycle to produce a glossy BLACK slip. 8073 Detail of the fleeing deer. This detail from the other side shows two rows of fleeing deer. The buff-red body can be seen where the black vitreous slip has flaked off. The sure deft hand of an expert pottery decorator is evident once again. Soft smooth raised shapes, some crisp lines and hard edges, all cleverly delineate the bodies, eyes, ears, legs, hooves and antlers of these animals in a thick slip. When dry the pot would have been covered with a layer of the iron slip and then fired with the smoky(reduction) to produce the black gloss. 8074 British Black-gloss vase showing chariot race decoration. 2nd century AD Colchester, Essex, England. BML. A lively though schematized depiction of a chariot race. The venue for 4-horse chariots(quadriga) and four competitors are shown in the middle of the race. Each is helmeted and dressed in a long sleeved jerkin and trousers and holds a whip and reins. This spirited rendering in barbotine, is made more vivid by the varied postures of the charioteers. This suggests that the potter had witnessed such an event himself. 8075 Red Gloss Pot - piped decoration. 1st century AD. Rheinland BML. This shows an interestingly different style of barbotine - or as here, simply piped clay slip - decoration as practised in Eastern Gaul. The pot comes from the Rhineland. The principal motifs are bunches of grapes and leaves. The curvilinear style characteristic of Western Gaul and Britain is not present. The overall effect here is formal, geometric abstraction of vine leaves and bunches of grapes. These are abstract symbols; raised dots and lines organised into a very stylised repeating pattern representing grape vines. 8076 Detail of vine and grape decoration. The detail shows clearly the technique and the texture of the piped clay. Notice the way the dotted, slip grapes form crisp points. On the top left, a chip on a leaf shows the lighter, buff body and barbotine slip colour underneath the final coating of vitreous red clay slip which produced the smooth red suface after a simple oxidised firing. 8077 Black Gloss Stamp-decorated cup with foot. BML. An example of a simple stamp decorated pot made at the edges of the Empire. A rather thick walled thrown bowl with the foot turned, or thrown on afterwards. The stamp, the roulette and the iron slip are Roman, but the result very different. It could be a new idea, but I suspect it is more likely to be a naive attempt to imitate the look of Roman relief decoration. 8078 A small "face" pot. Not surprisingly, face pots are found in most cultures; symbolic, naturalistic, crude or refined. It's hard to tell what meaning or significance such things have have unless one knows the context in which they were found e.g. a grave or an ancient rubbish tip, sophisticated or primitive culture etc. etc. Probably these provincial Roman examples are nothing more than humorous touches to simple kitchen jars. Note: it has been pieced together. 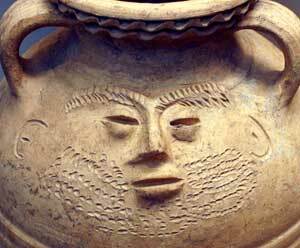 8079 A flagon with bearded face. This storage flagon was probably for water or wine. This idea of a bearded face on a largish rotund shape, a wine flagon, seems to have appealed to many potters down through the centuries. This one is not particularly special. Many similar designs would have been made all over the Empire. I know of no complete Roman kilns that have survived above ground, but we know that they were essentially similar to those used by the Greeks. See my earlier Tutorial No 3. In a Cretan village ca.1960. I saw a stone and brick updraft kiln of this ancient Cretan-Greek-Roman pattern still used today. See this sectional diagram. Many Roman sites have been excavated. This site, Amphoralis, near Beziers in Southern France has proved to be a very large Gallo-Roman pottery factory area. It was under fields some years ago when a few shards were identified as Roman. 8083 & 8084 Kiln floors, Amphoralis, France. Many pots and examples of kilns have already been unearthed, mostly the lower parts - fireboxes and up to the tiled perforated brick floors. There are many different kiln shapes. The average diameter across is about 2 metres. 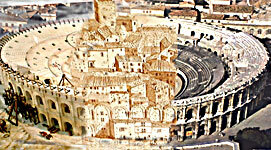 8085 Circular Roman kilns - Reconstruction. A simple one chamber updraft kiln with a firebox beneath a perforated floor to the firing chamber above. The flue is an opening in the roof, no chimney. The firing chamber perhaps made in brick and permanent with a bricked up door opening, but in many cases the upper part would be a mud, straw and shard structure broken down after each firing and rebuilt. Typically a permanent structure, round or rectangular brick and stone base, below ground, with an extension for the fire mouth on one side. Above on brick pillars was built an open chequered floor for the pots to stand. 8086 Rectangular Romano-British kilns - Reconstruction. These drawings are based on the excavations in England. The drawing on the left shows the surviving remains that were excavated. On the right my tentative reconstruction - including a faintly possible brick barrel structure for the firing chamber - based on the remains found: The brick lined fire box and the elaborate pierced brick floor on which all the pots would have stood is certain. The absence of any chimney bases and similar evidence from other Roman kilns means that the only flue would be holes in the roof. How this chamber was constructed is pure conjecture. My guess is that it was partly more courses of fired bricks plastered with sandy mud, probably leaning inwards. Then the top space, over the mass of pots beneath would have been part-covered with broken pottery shards mixed with mud and straw, leaving openings at various points to allow the air and smoke to escape. It was inevitable that some pots at the top would not survive. Variations on this sort of kiln have been built all over Europe for centuries, until very recent times. This drawing shows a collection of Roman rectangular kilns excavated in England. 8088 A small pile of over-fired oil lamps. This sad little pile of squashed lamps shows what happens when the kiln fireman miscalculates the amount of firing time, or wood, needed; or perhaps there was a very strong wind during the firing which caused a fierce, uncontrollable draft through the kiln. Whatever the cause, this particular pile of clay pots has been fired to a much higher temperature than the clay body could stand. The lamps softened so much that they slumped into a heap. With a still higher wind and a higher temperature they could even have melted! The Penguin Atlas of Ancient History: Colin McEvedy. Larousse Encyclopedia of Prehistoric and Ancient Art: Edited by Rene Huyghe. Larousse Encyclopedia of Ancient and Medieval History: Edited by Marcel Dunan. The Classical World: Donald E Strong: Landmarks of the World's Art series: Paul Hamlyn. Samian Pottery: British Museum Small Booklet. Roman Pottery: R.J.Charleston: Faber & Faber. Part I 1 - 8 Prehistoric & Ancient Pottery. Part II 1 - 6 Ceramics in China. the variety of prehistoric styles.